I have a horrible, $4.50 habit and it's not Starbucks. It's something SO much better - Aroma. This Israeli coffee house, located on Houston and Greene (with two more locations to open up in Midtown and UWS - yeaaah! ), is one of the best "fast food" meals you will have anywhere. The food is fresh and fast, with their soft bread outshining every other carb I've ever had (and we know I have discriminating tastes when it comes to carbs). Salads, pastries, and sandwiches are offered for breakfast and lunch. But what I walk blocks out of my way for is the iced chocolate, a heavenly frozen drink that kind of resembles a frozen hot chocolate (Serendipity III, eat your heart out). Light and icy, it's the perfect summer compliment to a hot and muggy day. I'm told if you love coffee, the iced aroma light is pretty damn good. 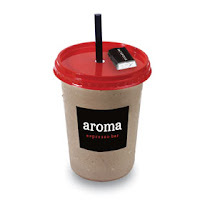 Aroma Coffeehouse is located on Houston between Greene and Wooster.